Skills and Abilities: Gruesome George has peak human strength, excellent street fighting skills, a sociopathic and violent streak that compels him to enact violence on others. George also has a high threshold for pain. Powers: (Speculation) He apparently has a meta-gene which makes him highly resistant to injury, drugs and pain. George was not like other boys. His father realized that early on. His father was an abusive drunken psychopath who took a hot iron to his son’s head because the boy spilled a beer. He pressed that hot it on as hard as he could and while George felt the pain of it there was hardly any damage to his skin [Batwing #33]. George’s early life was a constant battle, akin to what it must have been like to be a Viking or the offspring of some other uncivilized warrior class in the Iron Age. He never had a chance at normal. His father threw him to backyard fighting at age eight. This made him more violent and he was constantly in trouble at school, George honed his skills for combat and deception without ever seeming to develop a personal interest in anything other than violence. Psychiatrists were constantly at a loss on how to help George, and by eighteen he was doing his first stint in jail for battery and aggravated assault. Once inside, his reaction to prison was the complete opposite of its intended effect—he loved it [Batwing #33]. It didn’t matter if he won or lost a fight—the act was all that mattered. 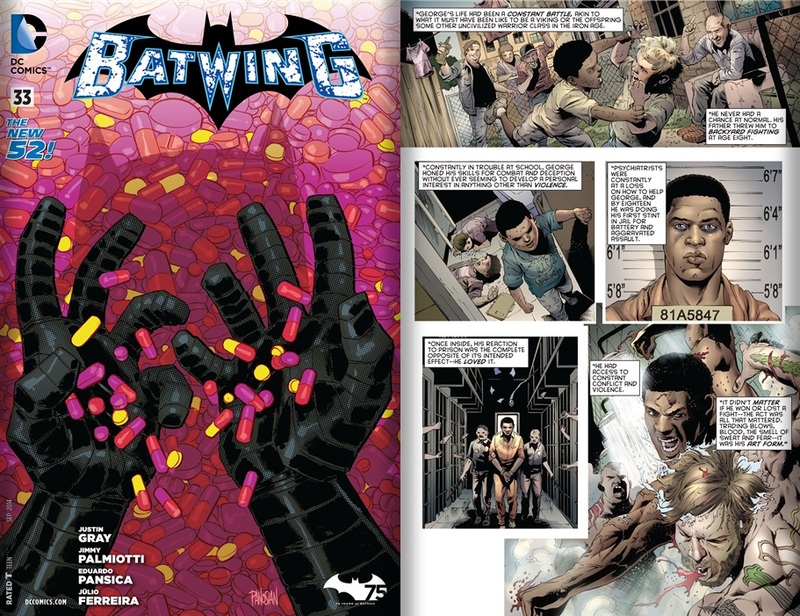 Trading blows, blood, the smell of sweat and fear—it was his art form [Batwing #33]. When he was released he returned to underground fighting, but it wasn’t enough to satisfy his need. Money, women, crime, none of these things interested old Georgie. He longed to be back in prison. Three days after his release from blackgate, George had a stroke of genius. He walked into the Gotham Police department and stated a fight. He put five officers in the Intensive Care unit and he barley had a scratch on him. George was happy, he was going back home [Batwing #33]. Back home, he rose o the top as the most feared civilian inmate. They threw him in solitary over and over again, but no one could reach his mind so they sent him to Arkham [Batwing #33]. George didn’t like Arkham Asylum one bit. He couldn’t taste anything. He was always sleepy. Worst of all, he couldn’t punch anyone. He was still capable of seeing through the haze of his medication clearly enough to realize he needed a purpose, something to live for [Batwing #33]. Then one night he gets a sign. He gets the hope for a better day. Problem is poor George was still in Arkham. Then five years later, a miracle when one night the whole world was turned upside down, the lunatics and super-beings bust out of their cells [Batwing #33]. George couldn’t get out of his jacket so he had an idea. He started a fight with Crock. It didn’t feel very nice but it did the trick. It took forty minutes before Croc got bored and gave up. George loved every second of it. The sheer violence and savagery of the attack wiped the medication from his mind. For the first time in forever he could focus on what he wanted. His years of hearing about bats were over [Batwing #33]. Outside he fashioned himself a bat costume and put his violent tendencies to “good use”. He started taking out thugs and leaving them for the cops. His methods though involved extreme acts of violence. Batwing tracked him down to his hideout, an abandoned sewer system. He was injured and was defeated by Batwing who left him for the police. 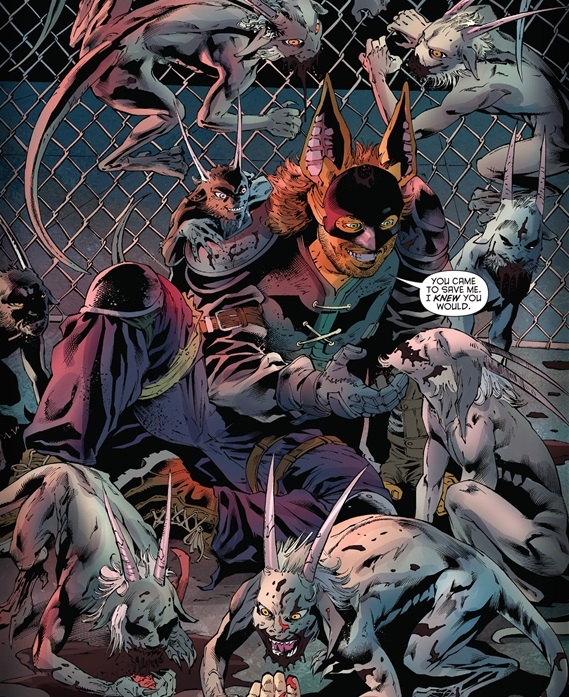 His pets showed up, massacred the cops and he evaded custody [Batwing #33].